Has anyone seen my Cabinet? In March 1997, a replica of the HMB Endeavour arrived in the UK from Australia. 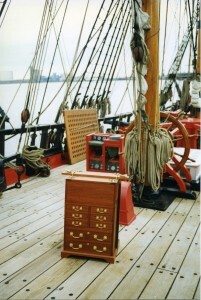 Aboard was a hand-crafted Cabinet of Curiosities. The Cabinet was, I wrote at the time, ‘intended to evoke a sense of mystery. What is in the cabinet? What is its message?’ Some thirteen years later a further question remains unanswered — just where is the Cabinet now? The Cabinet was an original piece, not an antique or reproduction, magnificently hand-crafted by Greg St John of the ANU School of Art. Inside were a series of eight artworks, each reflecting on an aspect of Australia’s scientific past. Together they sought to say something about the development of western science in Australia in the years following Joseph Banks’ voyage upon the original Endeavour. The Cabinet of Curiosities from Tim Sherratt on Vimeo. You can have a closer look at the artworks on Flickr and unpack the Cabinet yourself. There’s also lots of background information on the Cabinet’s own website. After it’s jaunt aboard the Endeavour the Cabinet returned to Australia as part of the Natural History Museum’s Kaleidoscope of Life Exhibition and appeared at the Australian Museum and elsewhere. It then travelled back to London with the exhibition. What happened after that? I heard that it might have been on display at the offices of the major sponsors RTZ-CRA (now Rio Tinto). Another report suggested that it had ended up at the Royal Botanic Gardens at Kew. In theory, the Cabinet was presented to the Royal Society of London, but that was more a symbolic act than a transfer of ownership. I just don’t know. I made a few unsuccessful inquiries a few years back and then gave up. But I thought it was time to try again, this time drawing upon the awesome power of the interwebs. Have you seen it? Do you know someone who might have had something to do with it? If you’ve happened upon a recent sighting or have any useful leads please include them in a comment below and we’ll see if we can finally track the Cabinet down. UPDATE 17 November: Reward offered! 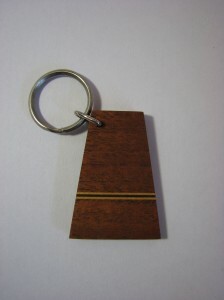 As I was rummaging through my Cabinet files last night I discovered some keyrings that Greg had made using offcuts from the piece of Australian red cedar he used to construct the Cabinet. If you can point me to the Cabinet I’ll gladly send you one. Your very own piece of the Cabinet of Curiosities! what I thought had happened was that it went into the bowels of the Natural History Museum in London. Perhaps you could check there? I have lost the contact that We met when we presented it at Australia House who was in charge of archives including JB’s original Cabinets. Nice to see the video again!